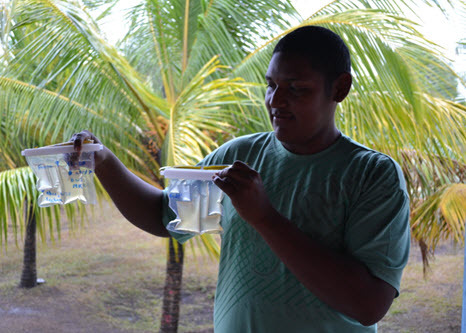 Millennium Water Alliance (MWA) and WaterAid Nicaragua conducted applied research to measure water supply service levels provided simultaneously by household rainwater harvesting systems and multiple other sources of water in the municipality of Puerto Cabezas, Nicaragua. Their goal was to better understand the quality of service for different kinds of water sources as well as how people perceived the different sources. 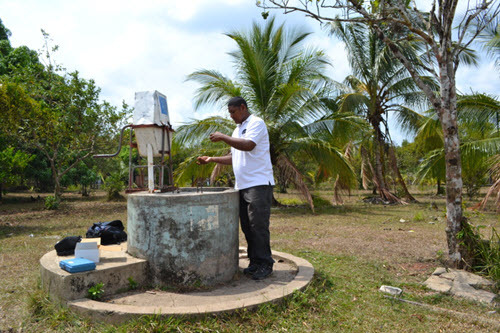 An important challenge was that water quality testing needed to be done in remote locations without access to a lab. They needed a water quality test for E. coli they could run on-site. MWA and WaterAid decided to use the Compartment Bag Test (CBT). In addition to testing for E. coli with the CBT, the researchers also tested for turbidity and pH. They analyzed samples from various types of water sources in the dry and rain seasons, monitoring differences between shallow unprotected wells, shallow concrete lined wells, rooftop rainwater harvesting systems, surface water and a hand-pump equipped borehole. The research was a collaboration of WaterAid Nicaragua, MWA, and the University of Leeds. It was financed by FEMSA Foundation, Catalan Cooperation Fund for Development, and Rotary International. Researchers found that the rooftop rainwater harvesting systems installed by the community with WaterAid Nicaragua and one hand pump-equipped borehole well provided the best and most consistent bacteriological water quality of more than 25 different water sources available in the community.